Google today announced a new, cloud-based service called Stadia that lets people play high-quality games on any device without downloading them. It also caters to people who like to watch others play games, in a way that's integrated with YouTube and competes with Twitch. The service supports high-end 3D games (such as Assassin's Creed) at up to 4K / 60 fps, on any device that supports Chrome, including Android phones, tablets, low-end desktops, and TVs with certain Chromecast dongles. It supports existing input devices, as well as a new Stadia Controller that links directly to the cloud via Wi-Fi. 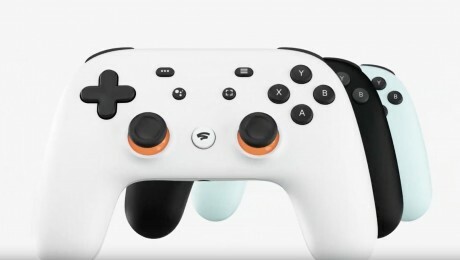 The controller has a headset jack, share/stream button, and Google Assistant button. Games run in Google Cloud datacenters, on special Linux-based Stadia instances that have twice the graphics performance of a modern game console such as the Xbox One X or PS4 Pro. The YouTube integration allows gamers to jump right into a multi-player game directly from a livestream. It supports advanced split-screen features, and the ability to share a playable game moment with other players with simple links. Stadia also supports cross-platform features to link to other game platforms.